Oshae Brissett goes up for a shot against Duke. Mandatory Photo Credit: Kicia Sears, The Juice Online. WHO’S OUT: Syracuse loses three out of its five starters heading into the offseason. Tyus Battle: Battle returned to Syracuse for his junior year after briefly testing the NBA Draft waters after his sophomore season, and will now enter his name into the 2019 NBA Draft. The results were mixed. With more depth around him, Battle still continued to lead SU in scoring (17.2 ppg) despite playing three less minutes per game (39.0 down to 36.3), and shot the ball more efficiently (43.1 percent up from 39.9 percent). But Battle also shot worse from the free throw line and 3-point line. He’s not projected in any mock draft, but can certainly work his way through the G-League or go the Euro route. Paschal Chukwu: Technically, Chukwu could apply for a sixth year of eligibility for a medical redshirt, but all signs indicate that Chukwu will move on. Chukwu was inconsistent throughout the year, and finished with 4.4 points and 5.4 rebounds per game. Frank Howard: Syracuse’s senior point guard had high expectations coming into this year, but a preseason injury cost him several early games, and Howard didn’t look like the same point guard who had averaged 14.4 points and 4.7 assists the year prior. Howard finished with averages of 8.9 points and 2.9 assists per game, and had an unceremonious end to his career, being suspended for the NCAA Tournament for a violation of team rules. Joe Girard: Girard hails from nearby Glens Falls and averaged more than 50 points per game as a senior while setting the New York State career scoring record. The question remains whether Girard’s game will translate to tougher competition, but it’s undeniable that Girard can shoot, a skillthe Orange can always use. Another concern is Girard’s size. He’s only 6’1″, which does not make him a great fit for the zone. Girard had narrowed his choices to Duke and Syracuse before picking the Orange. Brycen Goodine: Goodine is a classic Syracuse guard, wiry and explosive with a soft shooting touch. At St Andrews (Ma.) School, Goodine was named New England Class AA Player of the Year in his senior season. Goodine made his decision quickly, committing to the Orange back in November, 2018. He held an offer from Boston College, as well. Quincy Guerrier: The crown jewel of SU’s recruiting class is another classic looking wing at 6’7″, 190. He can score in a variety of ways, and continues the Canadian pipeline for the Orange, as he hails from Quebec. Guerrier was also considering Oregon and Illinois before choosing Syracuse. John Bol Ajak: Ajak is the most raw out of the four recruits, considered a project center with offensive upside. He’s currently ranked as the 272nd prospect in the country, but at one time, he was a top 75 recruit before getting hurt. He also had offers from Connecticut and Pitt, among others. Jesse Edwards: Though the Orange already has a sizable 2019 class, Edwards would bolster a rotation that has question marks at center. Edwards a raw, 6’11”, 205 pound Euro prospect that will need to pack on weight to compete at the NCAA level, but his potential is tantalizing. He’ll visit the Orange on April 1 and 2, and also has a visit to Georgia Tech lined up. If Edwards does not sign, the Orange will have one scholarship open. Perhaps they will test the grad transfer market again, either for a big man or a point guard. Outside of Howard, who has exhausted his eligibility, and Battle and Chukwu, who are not going to exercise their final seasons of eligibility, Syracuse is expected to have everyone back. Marek Dolezaj: Like in his freshman season, Dolezaj got off to a slow start before turning it on toward the end of the season. The stats only show that he averaged 4.1 ppg and 3.5 rpg, but Dolezaj was also SU’s glue guy, the person who would dive for a loose ball or make an extra pass that may not show up on the stat sheet. The goal is to not have Dolezaj play center as much, and also have him continue to gain more confidence on the offensive end. Bourama Sidibe: Sidibe regressed this season, seeing drops across the board in minutes, field goal percentage, points and rebounds. With Chukwu gone, Syracuse is banking on Sidibe being healthy and productive enough to play 20-25 minutes per game at center. Buddy Boeheim: Boeheim’s season ended unceremoniously against Baylor, going 0-6 from the field for two points. But Boeheim showed that he has the potential to leave Syracuse as one of the best shooters in school history, finishing the season shooting 35.2 percent from downtown. The only other freshman with at least 100 3-pointers in a season since 2002-03 with a higher percentage? Tyus Battle (36.6). Tyler Lydon (40.2). Eric Devendorf (37.6). Pretty good company. Howard Washington: Washington has now only appeared in a combined 21 games in his first two seasons at SU. This year, he suffered a stroke and decided to take a redshirt a year after tearing his ACL in practice. With Howard and Battle gone, Washington will be one of the candidates for more minutes in the backcourt. Oshae Brissett: Though Brissett did struggle with his outside shooting this year (27 percent from 3 down from 33.1 as a freshman), he increased is overall field goal percentage thanks to 44.1 percent shooting from inside the arc. 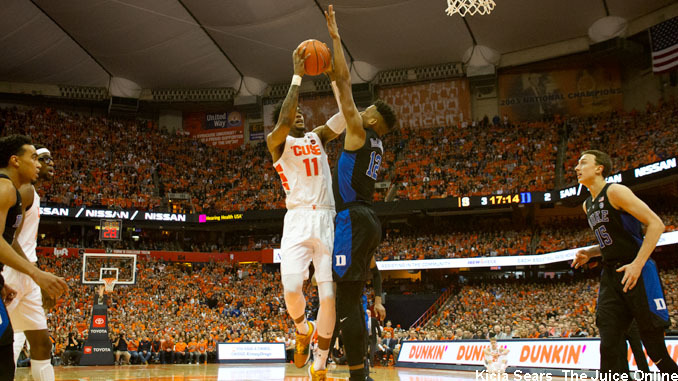 With Battle and Howard gone, Brissett will be looked at as one of Syracuse’s go-to players. Perhaps in his junior season, Brissett will focus more on rebounding and interior scoring, which made him a sensation in his freshman year. Robert Braswell: Braswell only appeared in 12 games as a freshman, but what little we got to see of him, we liked. Braswell appears to have 3-point range and plenty of athleticism. At 6’9″, 184 pounds, he will need to add more to his frame in the offseason, but with Elijah Hughes potentially shifting to a guard position, the minutes may be there for him to make an impact in his sophomore year. Elijah Hughes: In his first year at Syracuse after transferring from ECU, Hughes made an immediate impact, becoming one of SU’s top scorers at 13.7 ppg. His 25 points led Syracuse in its NCAA loss to Baylor. Hughes needs to work on his ball handling, but he is a prime candidate to be SU’s leading scorer in the 2019-20 season. Jalen Carey: Though Carey fell out of the rotation once Syracuse got into the thick of ACC play, you can see the potential. Carey possesses the athleticism and explosiveness to take his defenders off the dribble, a dimension that SU has missed since Tyler Ennis left. With Howard gone, Carey figures to see a big jump in playing time and production. EARLY MVP: Hughes is Syracuse’s leading returning scorer, and he’s our pick to be SU’s go-to guy next year. If he can get his dribble more under control and diversify his offensive game, he’ll score over 15 points per game. EARLY MIP: Carey will be Syracuse’s primary ball handler next season and will see a hefty increase in playing time. EARLY DARK HORSE: Of the freshman, Guerrier has the best chance to play early. He’s already got an NBA body and can score in a variety of ways. Depending on how Syracuse coach Jim Boeheim decides to use Hughes next year as a guard or forward, Guerrier may potentially be in the starting lineup. Is Hughes a guard or forward? This season, Hughes played exclusively at forward because Battle and Howard were entrenched as the starters. But with both gone and plenty of inexperience in the backcourt, could Boeheim shift Hughes to guard and then start Dolezaj or Guerrier at wing? The corollary to this: Who starts? Boeheim has plenty of options. Perhaps he can keep Hughes as a forward and insert his son, Buddy, into the starting lineup at guard. Generally, Boeheim prefers to have instant offense off the bench, which would be more suited to Buddy as the sixth man. Will Sidibe be ready? Dolezaj is still too slight to play extended minutes at center, especially once Syracuse starts ACC play. Can Sidibe take the next step forward and be a productive center? Can Carey deliver? Carey oozes talent and has the size and quickness to get into the paint at will. But he struggled with his ball handling and decision making, which makes sense considering he was more of a combo guard in high school. What will Syracuse do with its remaining scholarship? If Edwards doesn’t commit, Syracuse should look to add depth in the grad transfer market, especially at center. Will Syracuse be better offensively? The Orange looked stagnant for large stretches of time throughout the year. Though the Orange will not have much preseason hype, this group actually appears to have more offensive potential, and could be more fun to watch.